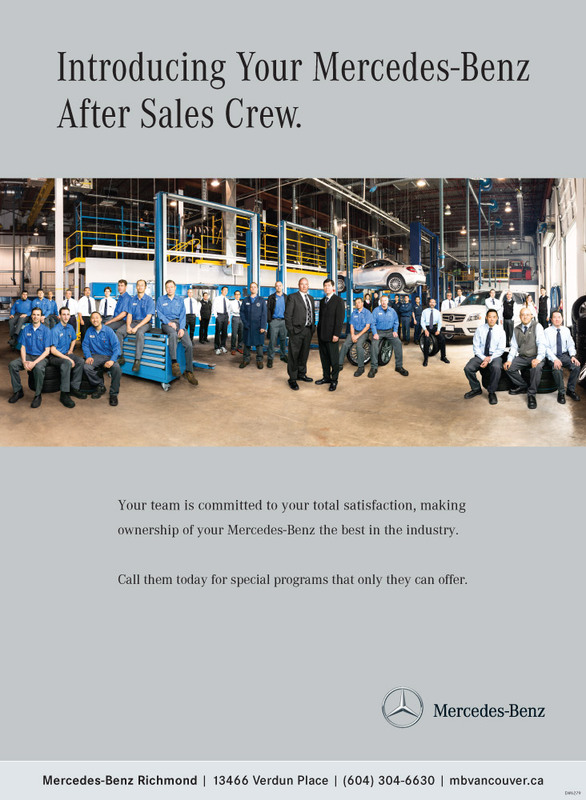 Back in the spring, Mercedes-Benz Vancouver asked me to photograph their parts & service departments. There are 5 departments in the Vancouver area, 4 which have 35+ staff and technicians. 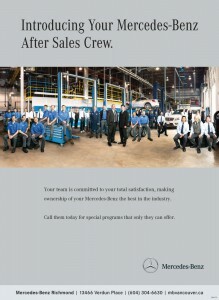 The standard everyone-stand-in-a-huddle picture was tossed around but didn’t seem to fit the culture of Mercedes-Benz. What we decided on creating were large group portraits that showed the staff and technicians in the environment that they work in. The challenge, how do you photograph 35+ people in the same area during a regular work day. Well, you don’t. The idea was to use the newest, and largest, service bay as the background for all 5 group portraits. 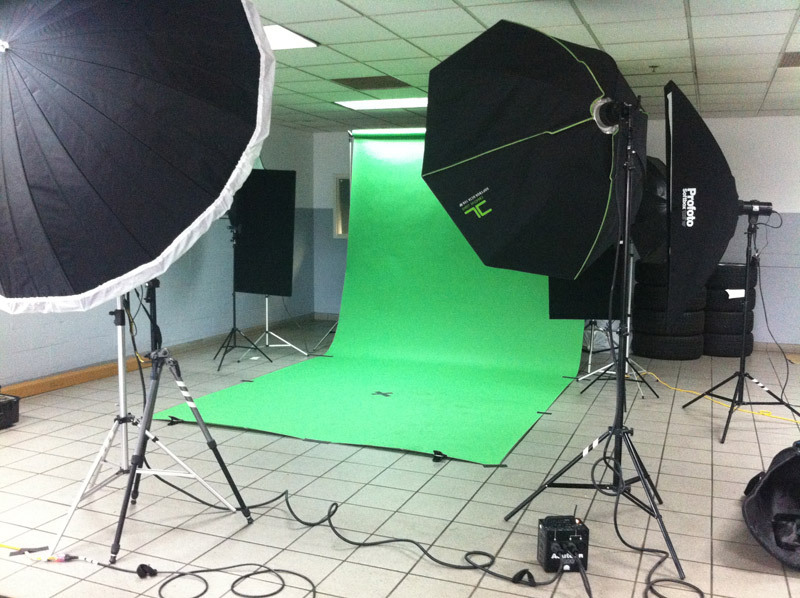 Each department would be photographed individually on a green screen in groups of 2 or 3, and the final image would be composite. First things first, the background. The Verdun Service Centre in Richmond is closed on Sundays, which makes for a perfect day to photograph the bays without having cars coming in and out, and technicians bustling around. The sun was out which meant I had more than enough fill light with all of the bay doors open. Knowing that the end result would have people in it, I shot the space with strobes as if they were all there. This allowed me to control the exposure of the areas where people would be in, and give me a general sense on how to light the staff for their portraits. I ran around with a bunch of strobes to fill in darker areas of the bays; tires upstairs, the bays on the backside of the shop, the furthest bay in the back. If you look closely, there is a shadow on the back wall of one of the ceiling lamps that is out of place. I think the final shot of the bays is a composite of 10 different images. Onto the staff. Over the span of a few weeks, I photographed each department in their own shop. The key light was a 5-foot octabox camera right with a 7-foot PLM umbrella with diffuser as fill directly behind me, a 6×1-foot stripbox behind the subjects camera right that would mimic the light coming through the open bay doors, and a few umbrellas lighting the green screen. While shooting the background, I measured the height of my camera to make sure the angle was consistent when shooting the groups of staff. I had also mocked up a final version of the image to get a sense of where people should be, and how to light them according to how far away they would be from the open bay doors. I’m not usually very keen on using a green screen, they can be tricky. On one hand, they are really easy to chroma key, on the other hand the green will reflect on most anything. I chose green because I knew the technicians pants were grey and I usually use a grey background for these types of images. So it was a toss up between re-constructing pants or taking out green. Retouching tip: Make sure you take out any of the green casts on your subjects while chroma keying subjects, viewers will notice. There are a few different ways of doing this; the way I did it for this project was to use a color blend layer, selecting a replacement color, and blending out the green. The rest of the story comes down to editing. After chroma keying all of the individual group portraits, the next task at hand was to place them all into the background. I had taken a few reference pictures while shooting the background, though they only helped a bit. Positioning and proportions is a bit of an optical trick. 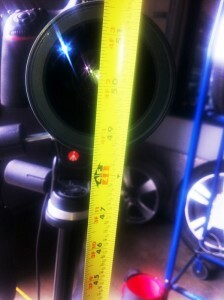 Our minds gauge size by referencing objects that we see often; height of a car, size of a tire. The size of each group of staff ends up being based on what’s around them, rather than what is actually true. To create a believable composite, shadows and levels/curves become a very important piece of the puzzle. Each group has their own layers of shadows and levels. To help blend, there is also a neutral-grey layer to allow me to independently dodge and burn each group. Adding reflections is just as important. The people standing around the car all have reflections either in the windows or on the hood (it’s hard to notice on low-res images). Details make the image. A little Photoshop trick for shadows; bring in a non-edited version of your subject, desaturate it, change the layer blend to hard light. What this creates is a base shadow to work off of, and because it’s from the original image it’ll match your subject perfectly. Lastly, global adjustments. Once everyone is in place, and they look like their grounded, I spend some time adjusting the overall image with a few more curve and level layers, and one more neutral-grey layer. These adjustments tie everything together. All in, each group portrait consists of 80+ layers. Planning is king when it comes to creating images like these. Knowing what your end result will be, then putting as many details into motion to create the best image you can make. PS: You think that Vanity Fair multipage covers are shot all in one sitting…. Nice use of depth. The zigzag pttaern really brings the eye out to the front man.I might suggest tightening up the shot, though. The whitespace on the right-hand wall is a second focus-line and can adversely pull the eye up and away from the zigzag and so the center of the image.Keep it up!